Buy select Miller ® welders and get a great rebate. 1 Buy select Miller ® products and get a great rebate. 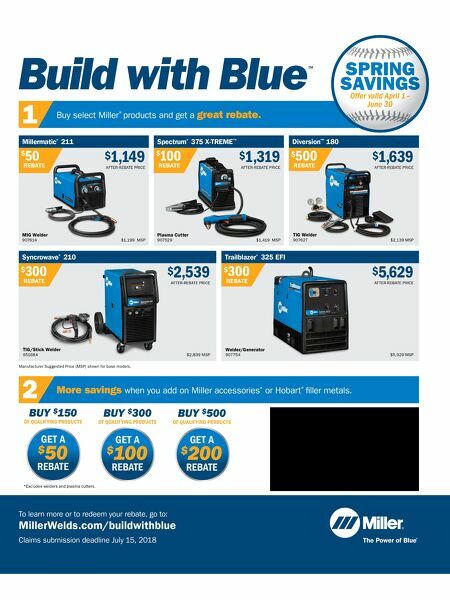 To learn more or to redeem your rebate, go to: MillerWelds.com/buildwithblue Claims submission deadline July 15, 2018 2 More savings when you add on Miller accessories * or Hobart ® filler metals. Millermatic ® 211 Spectrum ® 375 X-TREME ™ $ 50 REBATE $ 100 REBATE $ 1,149 AFTER-REBATE PRICE $ 1,319 AFTER-REBATE PRICE Manufacturer Suggested Price (MSP) shown for base models. Offer valid April 1 – June 30 SPRING SAVINGS Diversion ™ 180 $ 500 REBATE $ 1,639 AFTER-REBATE PRICE Trailblazer ® 325 EFI $ 300 REBATE $ 5,629 AFTER-REBATE PRICE Syncrowave ® 210 $ 300 REBATE $ 2,539 AFTER-REBATE PRICE MIG Welder 907614 $1,199 MSP Plasma Cutter 907529 $1,419 MSP TIG Welder 907627 $2,139 MSP $5,929 MSP Welder/Generator 907754 $2,839 MSP TIG/Stick Welder 951684 BUY $ 150 OF QUALIFYING PRODUCTS GET A $ 50 REBATE BUY $ 300 OF QUALIFYING PRODUCTS GET A $ 100 REBATE BUY $ 500 OF QUALIFYING PRODUCTS GET A $ 200 REBATE *Excludes welders and plasma cutters.